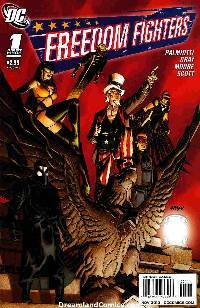 A new call to arms begins as Uncle Sam and the Freedom Fighters return in an all-new action packed ongoing series helmed by the writing team of Justin Gray & Jimmy Palmiotti with art by Travis Moore and Trevor Scott! A national mystery unfolds when the government learns of the existence of a Confederate super weapon intended to insure the South won the Civil War. Who built it and why wasn't it used? Find out when Uncle Sam leads the team on a quest through the hidden history of the United States! With new challenges and old threats returning to plague them, the stakes are higher than ever. Can even these stalwart heroes stand by their duty when their country calls?